The Kern River Canyon in Sequoia National Park is probably the most isolated place in California. It's a two to three day backpack to get there from any access. 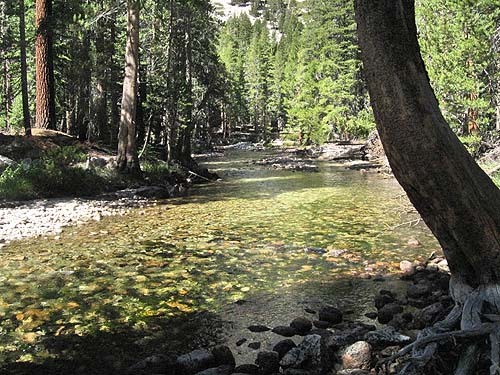 Its only real rival for remoteness is the Middle Fork of the Kings River a bit futher north in Kings Canyon National Park. 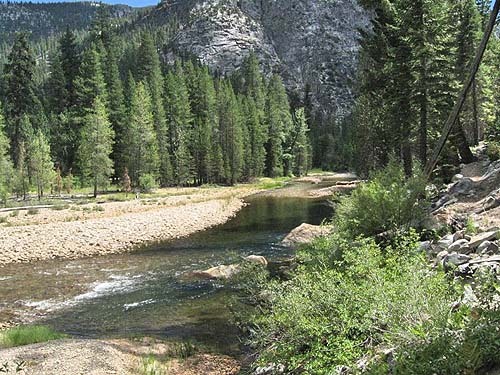 The Kern and its tributaries are the endemic home to three species of California's heritage trout, the Kern River Rainbow, the Little Kern Golden Trout, and the South Fork Kern Golden Trout. This was the particular attraction to me, to catch these fish in there native habitat. From its headwaters near Lake South America down to the southern boundary of Sequoia the Kern runs about thirty miles in a deep canyon. 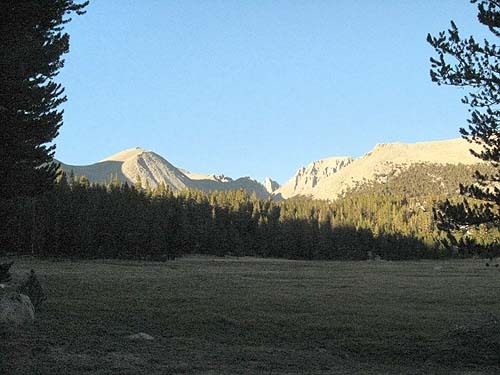 The western wall is known as the Great Western Divide of the High Sierra. To the east is Mt. Whitney and its 14,000 foot companions. I had set goal some years ago to walk and fish those thirty miles of canyon. My companion in this was my wife Pat. We considered various routes, and chose to make a loop of it by going in and out over Cottonwood Pass from Horseshoe Meadows near Mt. Whitney. 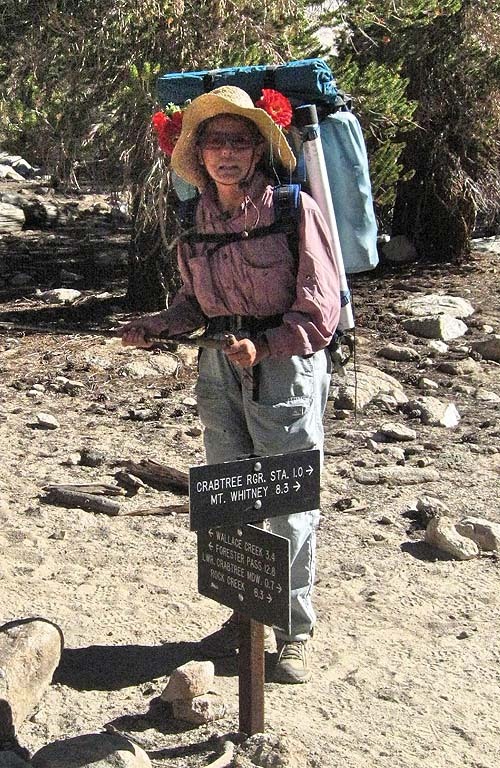 In brief, this took us north along the Pacific Crest Trail until we were opposite the headwaters of Kern at its north end, where we dropped down into it. This took three and a half days. We had three and a half days along the Kern, and then left it by the Golden Trout Creek trail which two and a half days later got us out to Horseshoe Meadows. The trail up to 11000 foot Cottonwood Pass is rivalled in tedium only by the nearby New Army Pass trail. They were obviously built by the same contractor who was paid by the mile. Hence they climb very slowly with a low gradient and interminable switchbacks that feel like a terrible waste of time. But eventually you get to the pass. From there things look up a bit. 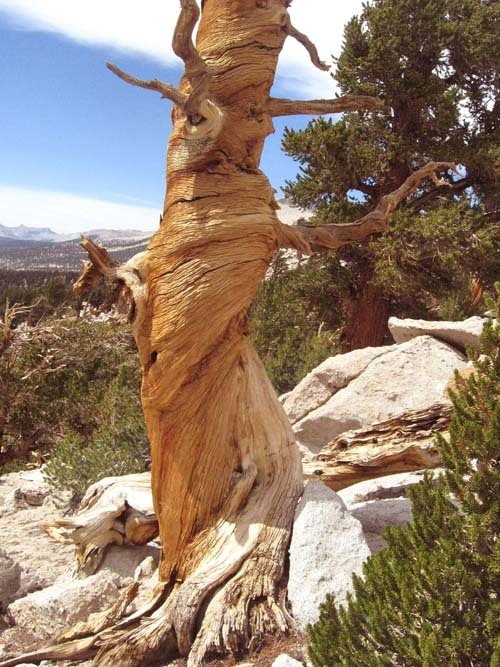 Along the trail from the pass one can only admire and wonder at the effect of wind, weather and a rigorous climate on the Foxtail Pines there, to create a garden of sculptured wood that went on for miles. Ten miles from the start, we reached Rock Creek where we were glad to stop for the night. We were too tired to fish that evening. At least for a start it was downhill for several miles along Rock Creek until we came to the crossing of it, and the start of the climb over Guyot Pass, about a 1500 foot climb to 11000 feet. Once over the pass we went through an area known as Guyot Flat. The ground for miles seemed to be a coarse granite sand, and again there were Foxtail Pines all around, but not as sculpturally stressed. It was very dry, no water, no streams around. The overall sense was desert, but with pines instead of cacti. Eventually we had covered another ten miles and reached Crabtree Meadow where we spent that night. Whitney Creek runs through the meadow and we caught golden trout. The trail out of Crabtree Meadow soon joins onto the John Muir Trail, and we started meeting a lot people bound for the Muir Trail's terminus on Mt. Whitney. The trail goes up and down over several ridges. 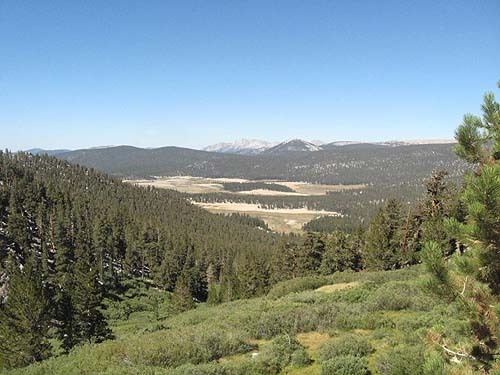 The southern Sierra is noticeably drier that the north, and the creeks running between the ridges seem like real oases. 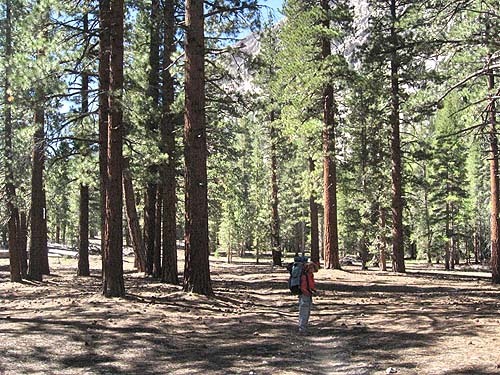 We stopped at Wallace Creek for lunch, along with what seemed like twenty or thirty other people, all Muir Trail walkers--not quite what we had in mind for a wilderness experience, but this would change by tomorrow. The afternoon took us up onto the Bighorn Plateau with fine views of the Great Western Divide. We reached Tyndall Creek with another ten miles done. Tyndall has a reputation as one of the better fishing creeks in that part of the Sierra. This I found to be true, although coping with the heavy willow growth along the banks was challenging. There is a direct trail from the PCT at Tyndall Creek down to the Kern, but we took the high route to get to the Kern closer to its headwaters. After crossing a low divide and a bit of up and down, the trail took us down to our first contatct with the Kern, a unnamed lake at 10,600' which it flows into and out of. I limbered up my fly rod and caught a number of goldens. The Kern River Rainbows were not in evidence. The reason became clearer and we walked down the trail along the Kern. 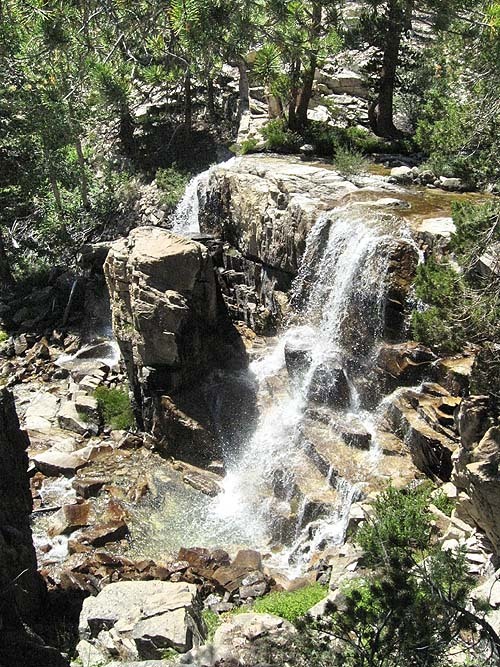 There was first of all a steep granite face that the river ran down in a cascade, followed a bit later falls that would clearly be impassible to fish. We continued on down to where the direct Tyndall Creek trail reached the river and camped for the night. This is where I did start to catch the Kern River Rainbows, and also some goldens. They had a good appetite for a yellow bodied hopper pattern. The trail descended steeply down to Junction Meadow which is where the gradient of the river flattens out and only loses about 1500' over the next 17 or so miles. The meadow is populated by an open stand large Jeffrey Pines and invited a stop to camp if we had not gotten there so early as mid-morning. As it was the invitation of the river was not to be refused and we fished for a couple of hours. The low gradient made swinging soft hackles an attactive way to present flies and the fish cooperated. From here we continued on down to just past the confluence with Whitney Creek for our next camp. Here we fished. Pat took a fall in the river (not serious) but lost her rod. This was sad, as it was a gift from her father, now passed away. But so much the better it to be lost this way rather than mouldering in a closet unused. We had a spare so fishing continued. 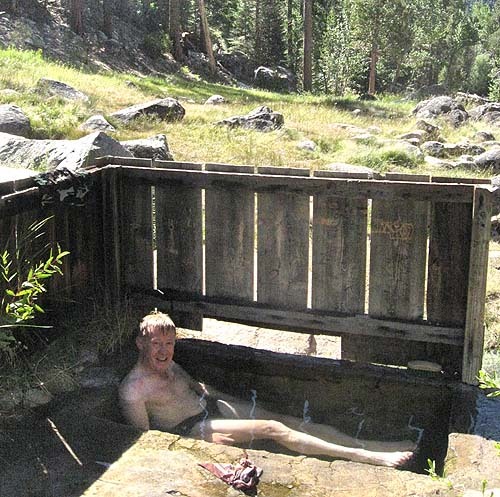 After this many days on the trail, the prospect of a hot bath was something to look forward to. We reached it about mid-morning. It's right down by the river and it's been improved a concrete tub for bathing. Earlier that morning we had met a party of three, some of the few people we met along the Kern, who told us it was quite hot. They were right. It was just bearable getting in, but once in, at least for a short time, it was a delight. We also fished some around there, but didn't catch much. From here followed the trail down to a spot between upper and lower Funstston Meadow for our camp. From here on down the fish got bigger, but harder to find and catch. Up above one will find goldens eagerly taking the fly behind almost every rock. Here it was a different proposition. The fish seemed to hold in the deeper holes, and have no interest in dry flies at all. What caught them for me was drifting a soft hackle off the ledge or dropoff going into the holes. 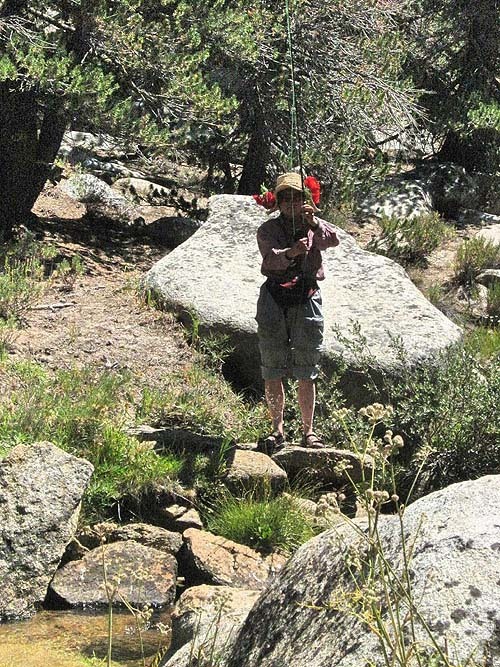 Once hooked, landing a 14 inch Kern River Rainbow on my 3 weight rod was challenging. The river continued to extend its invitations to fish as we made our way down the trail. At one memorable spot I found a series of holes where the above mentioned tactic worked well indeed. Then the trail moved away from the river and took us on a excursion to the west before it returned to the river at the park boundary where we stopped for the night. Here the river gradient steepened considerably and the fishing turned to a pocket water propostion. From the bridge over the river we could spot some magnificent fish, but we couldn't interest them in any of our flies. For several days now, we had had an easy time of it with the trail being mostly downhill. 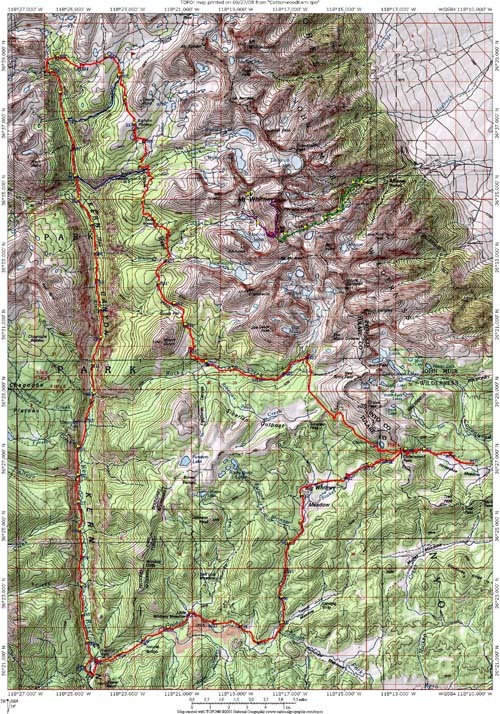 On this day it changed--the downhill had to be paid back to get out of the Kern River Canyon and back to the trailhead. See the route profile, about mile 54 At least we weren't carrying ten days food. The route took us up Golden Trout Creek which is one of the waters to which the golden trout is endemic. Our destination that day, a climb of 2600 feet was Tunnel Meadow where Golden Trout Creek flows within a hundred or so feet of the South Fork of the Kern, separated by a lava flow which occured a few thousand years ago. 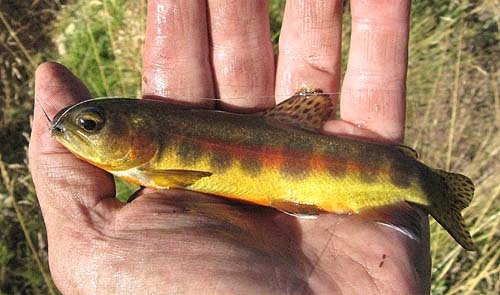 The South Fork is the other endemic water of the golden trout. I took the opportunity to catch goldens from both the waters. There was more climbing this day, but not some much as the day before. 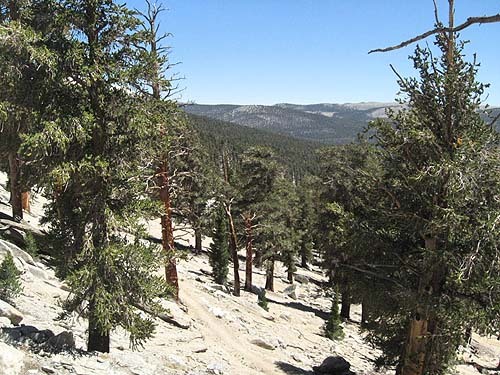 The route followed Golden Trout Creek up to Big Whitney Meadow. We spent an enjoyable couple of hours fishing the creek before we got to the meadow. Since the next day had us going over a pass, our usual game plan would have been to camp as close to a pass as offered a suitable campsite. The creek indicated on the map there didn't have drinkable water so we had to retreat back to Golden Trout Creek for the night. In spite of yesterday's retreat, we were over the pass and out to the trailhead at Horseshoe Meadows by about noon. From there it was on the the fleshpots and watering holes of Mammoth for some rest and recovery. So doing all this was something of an achievement for a couple of sixty-something year old pre-baby-boomers. There might not be so many trips like this left for us, but the beauty of the Sierra, the wild native fish, and the challenge of it all is a motivation to do what it takes maintain our fitness and ability for as long as we can.